Two Royals are better than one..
Exhumed these two Royals from their place of near eternal rest for long over due action. The blue model I bought at a thrift store a couple few years ago, while the red one was acquired father back in time, the details of which now escape me. I have never used either of these two vacuums. This is the hours-of-cleaning-later "after pic". 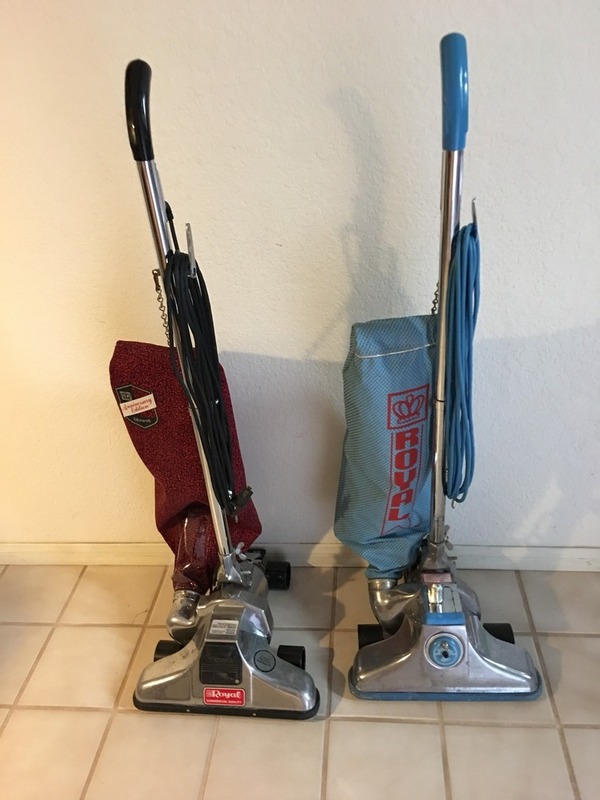 Someone in the area posted a want ad looking for a Royal Vacuum for his church, I responded that I had just what he was looking for. I went into my pile and pulled these two out as top contenders. He had given me a price range over the phone which left out a number of other Royals I have kickin' around here as well, but these two I thought might be better off with someone else. I have two more just like the blue one, one of which is now completely disassembled awaiting a long overdue reassembly, while another still in the box it was shipped to me in. The color scheme on the red one doesn't turn me on so it too was selected for culling. I eschewed "before" pics as they were not that bad off looking to begin with. Nonetheless my body aches from the time spent getting these up to speed. Both bags were removed, hand washed (buckets of muddy water resulted), and hung to dry. Both belts were replaced, both brush rolls diasassembled, cleaned and the nearly seized bearings on the red Aniversary model were oiled. The red 9 amp model also needed a split in the bag-fill-tube repaired, and new disposable bags were fitted to each machine. Steel wool was rubbed on all the metal surfaces, while compressed air was blasted everywhere. And the blue 4.5 amp model got the liberal dose of sewing machine oil it was so thirsting for. Bent electric plug prongs were straightened, scuffs and marks wiped away effortlessly with solvent, and lastly a dose of orange air freshener was inhaled by each vacuum as a final touch. All in I am very satisfied with the out come. And my buyer was very happy with his new blue Royal, while I will be using the red for a spell until it too is sold. Very nice. Good restoration job. That blue royal is my favorite of the Royals. I regret not buying one when I had the chance. I love the all metal, fan first Royals!! I've had a few in the past and they are fantastic carpet cleaners. They are so much easier to handle than Kirbys. The 89130's color scheme reminds me of the Royals that were made between the start of the FDR regime (1932) and the end of the Truman regime (1953), even though those ones also had black-painted handle assemblies. on my list of wants. You can imagine my joy at seeing one out of the corner of my eye at a Goodwill. Of course I snatched it up! My front badge (ajusto..) looks different than that one. Light blue but different graphics. Congratulations! I too have on occasion remembered where I got a vacuum. I bought this for $25 via a Craigslist ad. The seller originally wanted $50, but I made a 50-percent-off deal and she accepted it. Thx all. Love Stark Royals for no apparent reason, was so glad to find one. Yup KC3 that's the sound! Before I oiled the motor it was all horrible rachety noise. Let the oil work it's way to the bearing for a couple of hours and presto, sounds like new again just like your video. Here's mine hiding behind two bagless machines I picked up today for $5...total.